The most important name among these comedians in the period right after the war was that of Macario, undisputed star of the vaudeville theater and a well-known screen personality as of some ten years. 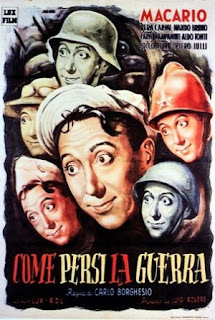 Macario's typical characteristics - his innocence, his romantic tenderness, his incurable optimism - struck two script-writers at the beginning of their career, Steno and Mario Monicelli, as potential material for a new form of "Italian-style" comedy, removing the actor from the facile conventions of the farce and creating for him a more carefully pondered character which could become the symbol of the average Italian male. The result was three fairly good films, produced one after the other in the studios of Turin (the capital of Italian cinema at its birth) and directed by Carlo Borghesio (born in 1905): COME PERSI LA GUERRA [HOW I LOST THE WAR: 1947], L'EROE DELLA STRADA [THE HERO OF THE STREET: 1948], COME SCOPERSI L'AMERICA [HOW I DISCOVERED AMERICA: 1949]. Macario, with his moon face and big eyes, his lilting gait, was the common little man battered by the gales of history. In the first, he is the innocent little soldier at the front of a lost war, in the second a poor devil who tries to scrape a living after the war with jobs of all kinds, in the third he has emigrated to the United States to seek his fortune. Borghesio was not a great director but he knew his job and the three films, while not outstanding, do succeed in expressing a fragment or two of the reality of those days. They were a great success, especially the first. As to Steno and Monicelli, they were to return to the character in the films they later directed, finding their ideal actor for the part in Alberto Sordi.